The 30 metre Commercial Surface Supply Diver qualification is the next step after Scuba training. This qualification is needed by commercial divers working in harbours, doing inland dam wall outlet maintenance, as well as shipping repairs and close inshore salvage. 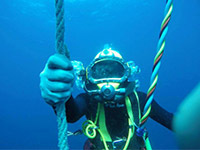 The qualification allows divers to use scuba and surface supply diving equipment and the diver can do more tasks in the underwater working field. These training tasks include underwater welding and cutting, underwater dredging, air lifting, using salvage equipment, construction tools and a range of hydraulic and pneumatic tools used in the onshore / inland diving tasks. 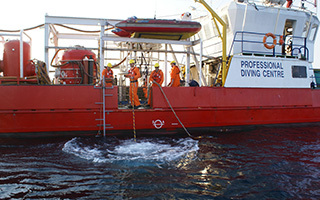 The Class III diver may not work in the oil & gas offshore diving industry. Completed and passed Diving Medical Examination as per South African Diving Regulations and be in a healthy fit state. Be able to add, subtract, multiply and divide, calculate percentages, solve simple formulas such as gas laws. Understand written and verbal communications in English and communicate comfortably with other people. Have completed 30 metre Scuba course for 4 weeks or start Scuba course before attending Class III. Basic seamanship and surface supply from SSDE diving vessels having LP compressors and HP. backup.